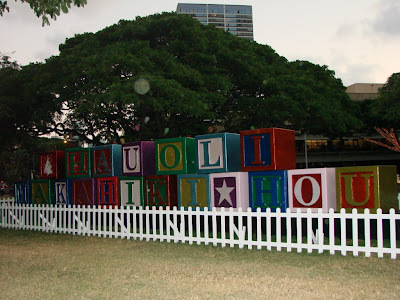 Just one day left in the year and its almost time to say “Hau’oli Makahiki Hou” as these blocks at the Honolulu City Lights display spell out. That is the way we say “Happy New Year” here in Hawaii. A bit of exactly what this means. Hau’oli is the Hawaiian word for happy, Makahiki is a Hawaiian period of resting and feasting that lasted four month in which no wars or conflicts were allowed… it also happens to be the Hawaiian word for “year” and Hou means “new”. Put that all together and you get “Hau’oli (happy) Makahiki (year) Hou (new)”. Impress your friends this new year but do make sure you pronounce it correctly thats… how-OH-lee mah-kah-hee-kee ho. Happy Holidays to all of you from the State of Hawaii. 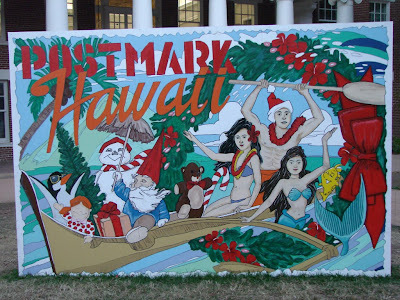 Here is a giant holiday postcard on display at the Honolulu City Lights display just outside of Honolulu Hale. Go with a bunch of your friends as you can take a photo as the faces on the postcard all open up and allow you to stick your head right into the postcard. Hmm I wonder how much postage it would take to mail to the mainland? 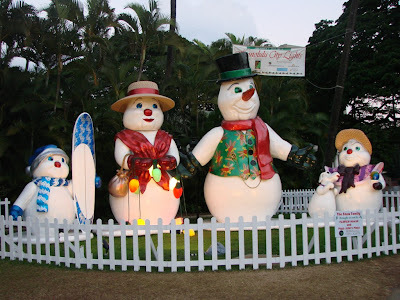 The snowman family at the Honolulu City Lights Christmas display gets ready to leave for the season before they melt away. How you ask have they not melted yet? I think it must be some special “Christmas Snow” designed by Santa especially for Hawaii. Hurry up if you want to see them near Honolulu Hale cause as the year end the display does too.